The Beatles! Indisputably the best-loved and best-known rock band of all time! And equally indisputably among the most overrated! For indeed, how could they be the one without the other? No matter how talented each of the members were (and they were), no matter how hard-working (and they were), no matter how innovative (and they were), no matter how influential (and they were), how could any group of popular singer-songwriter-instrumentalists possibly rise, in anything like objective terms, to the unparalleled level of cultural dominance enjoyed by the Fab Four? The planet is home to a lot of musicians. 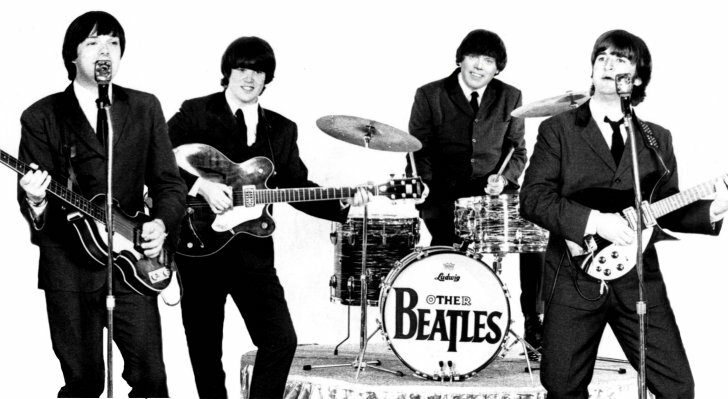 Hundreds of thousands of bands, you have to concede, must have been as talented, or as hard-working, or as innovative at the Beatles, and it would be silly to deny that there must be, or have been, at least several hundred that could meet the Beatles, so to speak, on all three scores. As for influence, well, influence is a tricky bugger, innit? 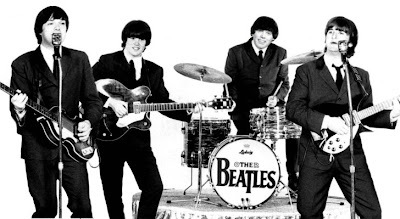 The Beatles would have to be on any rational person's short list for Most Influential Band. To acknowledge this is, however, is to stop well short of an implicit (and often explicit) assumption in our folklore of music history: the Beatles came along, and everything changed. So sure, the Beatles influenced other musicians. But then, the Beatles were deeply influenced themselves, by their own musical mileau and by the technologies available to them. They were, arguably, among the most influencED band of all time. So it is interesting to imagine an experimental control Earth, where everything is exactly the same except that George, Paul, Ringo, and John never meet. How would the history of music be altered? No way of telling, of course, although obviously there would be a lot of specific very well-known songs that never got written. But in terms of the overall sounds and song forms, the history of popular musicology? I would have to think that, if the Beatles had never been, music today would sound pretty much just like it does today. The Beatles, I believe -- pointlessly, since it is a belief equally immune to attack or proof -- are far less important as a transformational force in musical culture, or even as creators of a very popular body of musical work, than as a symbol, a little bit of synecdoche that helped and helps people make sense of a period of rapid changes, musically and culturally, in the 1960s. Which brings us, in a roundabout sort of way, to our project. I have assembled recordings of the thirteen (13) Beatles albums that no less an authority than the Wiki describes as their core canon. And I am going to listen to them, and talk about them. Will I be underwhelmed? Will I be blown away? We'll find out! Your job, meanwhile, will be to skim what I write and then send links to all your friends, so that they will go to my posts and my "clicks" numbers will go up, and that will make me feel all validated and like this little hobby of mine, keeping a blog, isn't just so much time hurled down the toilet. But I digress. Two albums of competent but unremarkable popular music of the early 1960s, with several songs that are extremely well known, and therefore immediately accessible, by virtue of having been recorded by the Beatles. Includes music from the odd film of the same name. Still fairly pop in tone, but with some impressive glimmers of complexity and sensitivity. I have no idea what's on this album. This is the one where you begin to get a little bit of an edge. Also -- I'm vague on this -- this is about where the lads stopped pretending they were recreating American blues music; contrary to Whig rock history, the next three decades of popular music will be dominated by the influence of British folksong. Who can keep these two straight? These are something like the alternative rock Beatles albums, if memory serves, and I vaguely expect to like them the best. The title track sure is weird. Seriously, if it wasn't so familiar, you'd never expect that it could ever possibly become popular. I don't really know what to expect from rest of the album. Ah, Magical Mystery Tour. When I was a very little boy, I had very little record player with the Sword in the Stone soundtrack, the Jungle Book soundtrack, John Denver's Greatest Hits, and the Magical Mystery Tour album. I could have done much worse. MMT, by dint of that familiarity, is my starting-point favorite Beatles album, despite that it is only really one side* of music and with that one side including "Blue Jay Way." *If you are too young to know what a "side" of music is, I simply can not believe you are reading this blog. "While My Guitar Gently Weeps," if memory serves, plus 3 4/5 sides of filler. Includes "Rocky Raccoon," very possibly the worst song ever to have become, by dint of sheer familiarity, beloved. The title track sure is weird. Seriously, if it wasn't so familiar, you'd never expect that it could ever possibly become popular. I don't really know what to expect from the album. The one where they're crossing the road and don't really like each other anymore. I forget what's on it, but I suspect it's one of the strongest. I think it's the one with the medley of all the very short songs at the end. Like "The End." The one where they loathe each other and can't wait to quit being the Beatles, and largely a product of post-production. I dunno. I've always kind of LIKED "The Long and Winding Road," but then I'm just a big mush at heart. I don't expect it to be great. And there we have it! The journey begins! Oh, a new dorky project! Yay! While you were talking about the Beatles at the beginning, I was, naturally, drawing comparisons to Shakespeare, another of these iconic cultural influences. As a result, when I read, "So sure, the Beatles influenced other musicians. But then, the Beatles were deeply influenced themselves, by their own musical mileau and by the technologies available to them. They were, arguably, among the most influencED band of all time," I thought, Fun! Now, to what extent could we likewise argue, assuming your premise is valid, that Shakespeare became culturally dominant because of influence rather than despite it (in a non-Bloomian sense). So, that's what I think about on Monday mornings! You? "...to what extent could we likewise argue, assuming your premise is valid, that Shakespeare became culturally dominant because of influence..." as opposed to intrinsic merit, do you mean? Well, you'd have to clock that extent at well north of 99% in Shakespeare's case, wouldn't you? I mean, Shkspr has long, long, long been more institution than artist, so the general gist of what I'm saying about the Fab Four here applies to him quite exponentially. Hey! I really like that song! ...to have become, by dint of sheer familiarity, beloved. Oh. Right. That's why I like it. That's why I like pretty much all the music I like. Either it's a ballad that describes something I identify with, it's a track from on of a few cassettes I was stuck with on along road trip, or it's a song one of my past rooommates played daily. Hey, which is worse: Rocky Raccoon or Friday. 'Cause I like them both. I like Friday too, well enough, allowing that it was composed by a thirteen year old. Oh good, I'm glad you're back on this, because I was so enjoying stealing the CDs you had out from the library and singing along in my office like a twelve-year-old misfit in the mid-seventies discovering the recent past. I look forward to the post where you list the several hundred bands who were as talented, hard-working and innovative as the Beatles, and even all the subsequent years of posts in which you provide supporting evidence for your extraordinary claims. I'm actually very excited about this little project of yours. Back in the day, I was a little Beatlemaniac myself. The White Album is tres weird but I can still recall almost every song on it. I actually saw Let It Be in the movie theater with my dad. I fell asleep midway through. sgt. pepper has some awesome stuff on it, including one of my all time favorite Beatles tunes, Within You and Without You (though I may be misremembering the title). I love when you can start to tell Paul and John and George songs. I look forward to all these posts...except for the early stuff, which I think is forgettable. Wake me up when you get to Norwegian Wood. Darling: My extraordinary claim based on statistical likelihood. Likely most of the several hundred bands who were as talented, hard-working, and innovative as the Beatles never had the extraordinary good fortune to land a record contract. So I'm certainly not going to start throwing names up in the air. Except maybe the Pixies. Or Plague of Daisies. Jenners: "I love when you can start to tell Paul and John and George songs," meaning you look forward to my being able to distinguish the stamp of the individual songwriters? Or, with a few words missing, you look forward to my persona's trademark pluck as he takes the masters to task? If the latter, WHY IS RINGO EXEMPT?!? Oh this sounds like a fun new dorky project! I'm about as familiar with the Beatles as you seem to be, except your Magical Mystery Tour is my White Album (ie, starting-point favorite by dint of familiarity). Even so, "filler" might be an apt term for much of it. I can never recall all the various good Beatles songs, but I think the one I've long been the most *impressed* by (both musically and in terms of the primitive recording technology of the time) is on Sgt. Pepper's. No no, not the silly title track. Oop, couldn't help but pull up and listen again to "that song" and sure enough. Gives me shivers...of enjoyment I think.